Description : For over 85 years Schlage has provided homeowners with innovative security products of the highest quality. When you safeguard your home and family with Schlage portable, mechanical and electronic locks and accessories you ensure security as well as peace of mind. No more keys to hide, lose, carry or forget. 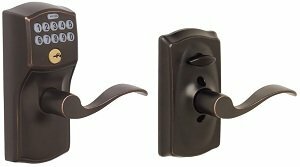 Keypad levers offer keyless access and provide maximum security protection to make your life more convenient. Install and program in minutes with no Wiring required. For back, side or garage entries – also ideal for offices, work out rooms, wine cellars or any room requiring access control. Applications: Residential single- and multi-family doors. Backset: Universal latches and deadbolts fit 2-3/8(60mm) or 2-3/4 (70mm) backset. Door thickness range: 1-3/8″ to 1-3/4″thick.